Jesus rose from the dead. He is alive! That’s what we just celebrated on Easter Sunday. Tradition tells us that Jesus appeared, in bodily form, to his followers, over a period of 40 days, following Easter. Then he ascended into a cloud and disappeared from their sight. In these Sundays following Easter, we are examining God’s Word to us in the book of Acts. And we will be considering how the risen Jesus is present to us today. 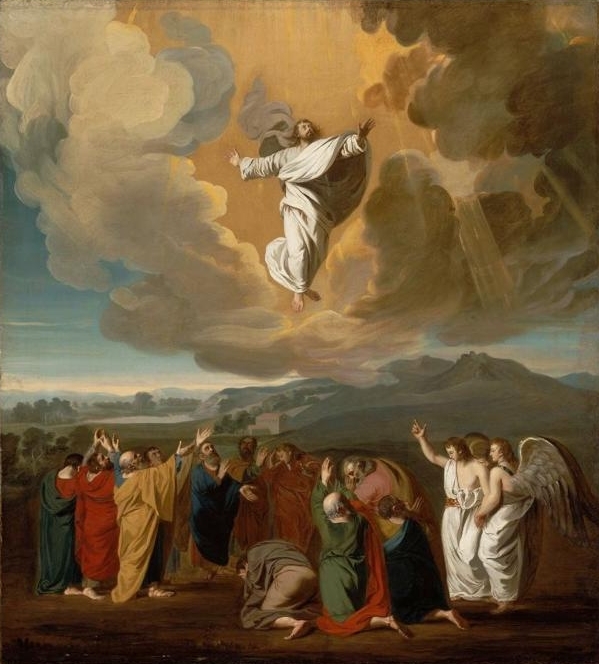 And the book of Acts begins with that event of Jesus’ ascension; and event, as we shall see, which is vital for us in better understanding the presence of the risen Jesus in our lives today. Well, this morning, I would like to claim, that it IS a good thing he’s gone! All of these people are right about that, BUT, of course, for all the WRONG REASONS! Yes, he has ascended into heaven. Jesus of Nazareth, the Son of God, with flesh and blood just like you and me, who lived in a particular place in a particular time, who spoke with an audible voice, who weighed so many pounds, who had such and such color of hair, this ONE is no longer here! He has ascended into heaven! But because Jesus is gone does not mean that he is absent or has abandoned us to struggle in this life on our own. It means that he is in heaven “sitting at the right hand of the Father.” That means Jesus is now in charge of this broken world. As the writer of Ephesians puts it, “God, the Father, has put all things under his feet and has made him head over all things.” (1:22) This is the risen Jesus that we know. This is the risen Jesus that is present to us today. Being in heaven doesn’t mean he’s absent from us, but rather that now, he can be everywhere and anywhere. It means that he can be with us in our sufferings and temptations. It means that he can be with us in our joys and successes. Being at the right hand of the Father in heaven means that time and space can no longer confine him. Sitting at the right hand of the Father means that he can be with us now as resurrected and ascended Lord to give us his help, his strength, his guidance, his comfort, and to share with us his victory over death. I cannot be standing here in the sanctuary and be out there in the parking lot at the same time. I cannot not be here is Waseca with you, at the same time that I am in Texas with my children. That is impossible because I am confined to this body at this time and place. That is the nature of living in time and space. But not for Jesus! Because Jesus is now ascended in heaven and sits at the right hand of the Father, he is no longer confined to space and time. There is no place and no time where Jesus is not present to share his love. From the most distant black hole light years removed from this place and time to the personal privacy of your home, Jesus is there. Jesus was speaking of the coming gift of the Holy Spirit that he would shortly give to his disciples. Through the Holy Spirit, Jesus will be able to be present with his disciples, and with us, in an even more personal and intimate way than when he walked around on the dirt roads of Palestine. He will be present as the risen Christ who has defeated the powers of sin and death. He will be present as the friend of sinners, as the one who suffered and died and rose again so that our sins might be forgiven. He can now be not just WITH us, but IN us, dwelling in our hearts through the power and presence of his Holy Spirit. Through the Holy Spirit, the presence of Jesus is no longer restricted to one place or to a handful of people. Jesus will be present to all of his followers in every place. Jesus is not absent, he is here! Whenever we are ashamed of our deeds, he is here to forgive us, to clothe us in his righteousness, to make clean and whole again. Jesus is not absent, he is here! Whenever we feel alone and forgotten, Jesus can be with us to comfort us in our loneliness. Jesus is not absent, he is here! Whenever the Gospel is preached, or whenever communion is shared, or whenever water is poured at this font, we can be confident that the risen, ascended Jesus is present here . . . for us . . . now! Jesus is not absent, he is here, present with us in the ministry of St. John Lutheran Church today. Even though we must live in a world that often says, for all the wrong reasons, “It’s a good thing he’s gone,” you know, for the right reasons, that it IS a good thing he’s gone! It’s a good thing that our risen Lord has ascended to the right hand of the Father, because then he can be with us always, everywhere, forever. One day, we will see our risen Lord face to face. Until that day, he is present with us, to strengthen us as we strive to serve him, to forgive us and pick us up when we stumble, and to comfort us as we face the struggles of this life. Jesus has not left us, he is alive! Jesus is risen and he is with us, in the church and in our lives. And we are witnesses of these things. Let us proclaim this truth to all the world!